The Ashalim solar energy plant in Israel is expected to produce 121 megawatts of solar energy in the Negev Desert by 2016, providing enough energy to fuel 40,000 Israeli homes. 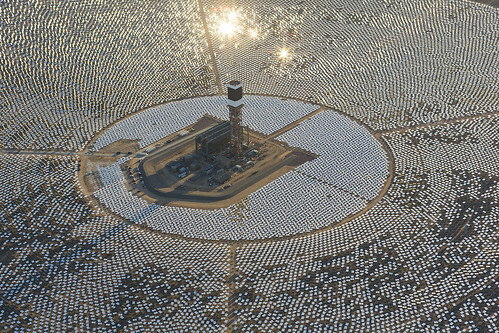 The company responsible for building the facility, BrightSource Energy, also built the 377-MW Ivanpah plant in California’s Mojave Desert. 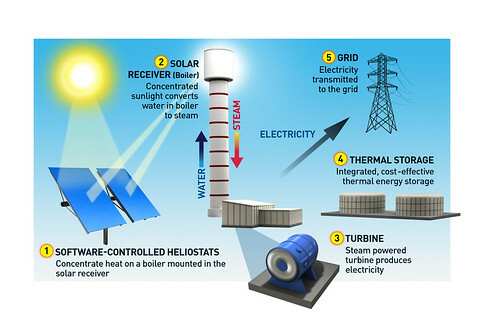 It’s an engaging way to produce electric power, using the concentrated solar energy to produce steam, which powers turbines to produce the actual electricity. Just as wind turbines are located where there’s constant, predictable wind, massive solar farms are a natural choice in desert climates — especially those with open space to spare. The desert isn’t good for much else, so let’s have at it! After many bureaucratic hurdles, BrightSource –– which uses mirrors called heliostats to focus the sun’s rays on a tower to create steam to drive turbines –– is finally returning “home” and is fulfilling a dream to help make Israel energy secure, says BrightSource Israel CEO Israel Kroizer. He was with BrightSource from its genesis and says that the new solar plant, developed by the Megalim consortium of BrightSource and France’s Alstom SA, is more than a business deal — it’s personal. BrightSource, he notes, employs about 400 people, 300 of whom are engineers and development staff working mainly in Jerusalem, where its international R&D happens. The $1.1 billion solar thermal energy plant being developed in Israel is the country’s first large-scale solar energy field, and one of the biggest of its kind in the world. It will heighten Israel’s prominence on the map of clean-tech entrepreneurship and green energy production. Kroizer says: “The government gave us a very good structure and we appreciate it very much. The way we will run this project is as though it will be the crown jewel of all our projects. Yes, even over our project in California. “The Israel project is close to us and everyone involved in it wants to make it the best,” he tells ISRAEL21c, not disclosing any financial developments still in sensitive boardroom talks. This entry was posted on Monday, October 28th, 2013 at 4:24 pm	and is filed under Cool Stuff. You can follow any responses to this entry through the RSS 2.0 feed. You can leave a response, or trackback from your own site.